Richa Hingle of Hobby And More, started baking in 2008, but you won’t believe that when you see the lovely breads she comes up with. Do check her blog for more such innovations! It is my pleasure to have her today on Tongue Ticklers to share one of her tasty recipes. Did you ever think of strawberries in bread, and that too one made with sprouted wheat?! Astounding but mouthwatering combination – isn’t it? I started my blog to just jot down my recipes and creations and ventured into baking. Over the first 2 years of blogging, I picked up on baking yeast breads. I bake bread pretty much every week, sometimes repeated recipes and sometimes new. I like to add fruits, vegetables, grains and seeds to my breads to make them wholesome. I cannot remember the last time I ate white bread. White bread just feels like fluff now :). I was thinking of what to use in this bread for the guest post, and I wasn’t sure if the new grains like quinoa were available in India. So I decided to stick to the most used grain. Wheat. This bread has sprouted Wheat, whole wheat flour, some high gluten bread flour, and some strawberries too. The fruit adds a fun dimension to the bread and hides some of the wheaty taste, which sometimes can be strong enough to distract some people from liking a whole grain bread. You can replace the fruit with any fruit of choice. Hope you all like the bread! 3 Tablespoons raw sugar or equivalent jaggery/agave/maple syrup or other sweetener. Add the yeast and 1 teaspoon sugar to 2 Tablespoons warm water and mix well. Let stand for 10 minutes or until frothy. In a blender, puree the strawberries and sprouted wheat with the remaining sugar. You can add some of the sprouted wheat as is. I like my breads without the whole grain popping up while eating a soft slice. In a bowl add 1 cup bread flour, 1/3 cup wheat flour, wheat gluten and salt and mix. Add in the yeast mixture, oil and fruit+wheat puree, 1/2 cup water and mix. Let dough sit for 5 minutes covered. Knead the dough for 8-10 minutes, by hand or in stand mixer, Scraping sides every 2-3 minutes if using a stand mixer. add more flour or water in little quantities if needed. As with any fresh fruit/vegetable bread, the fruit gives out a extra moisture than a normal bread, while the dough sits for the rising time. So keep the dough soft and not too sticky. For a good gluten development, you can punch the dough, pull and fold, throw it on the counter and have fun with it during the kneading! Spritz the top of dough with some oil spray. Place dough in a covered container in a warm place for 1.5 hours to rise until atleast doubled in size. Punch it lightly. For mini loaf pans, divide dough into 2 parts. Knead and shape into a loaf by pulling on all sides, or by rolling it out into a rectangle and rolling the rectangle from one side and tucking the other edge under like a jelly roll. Or you can make just one loaf for the regular bread loaf pan. 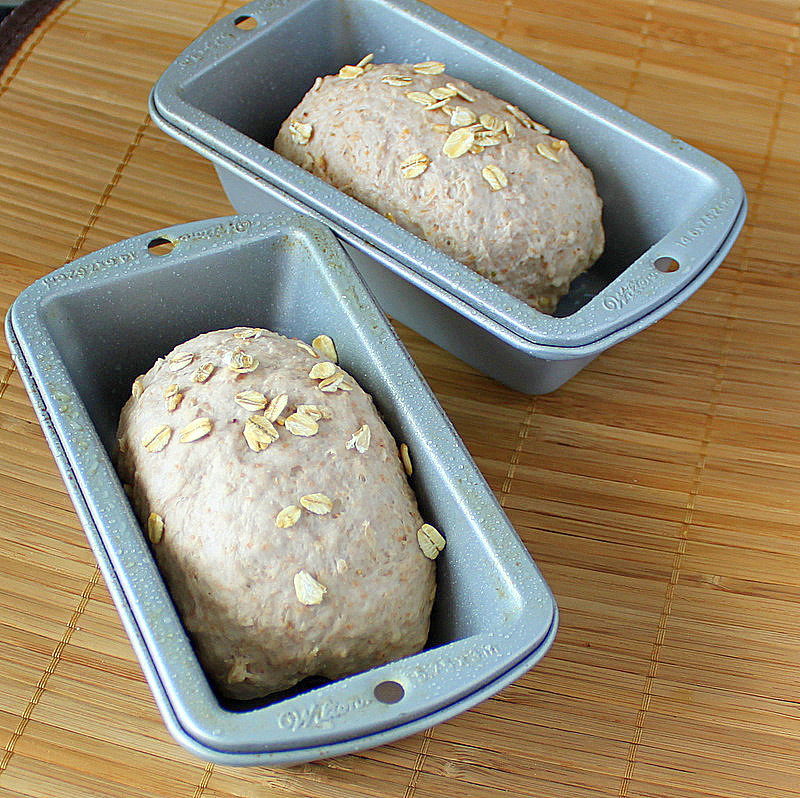 Place loaf in greased mini bread pans. Spritz the top with water and then spritz a little oil spray, and cover with kitchen towel. Place it in a warm place or warm oven for 45 minutes. Remove bread from pan and let cool for an hour. I usually put the bread in the fridge to cool even more for atleast another hour before slicing. The slices then come out perfect. The breads are usually soft and can easily gets squished while slicing. Slice and enjoy as is! or topped with some fresh fruit compote, chutneys, creamy herbed berry topping(vegan cream cheese mixed with mashed berries and herbs), or marmalade, or nut butters, or topped with a tofu scramble! Store bread in refrigerator for a 7-8 days, because it has fruit in it. you can store a regular fruit less bread outside. I certainly loved it! 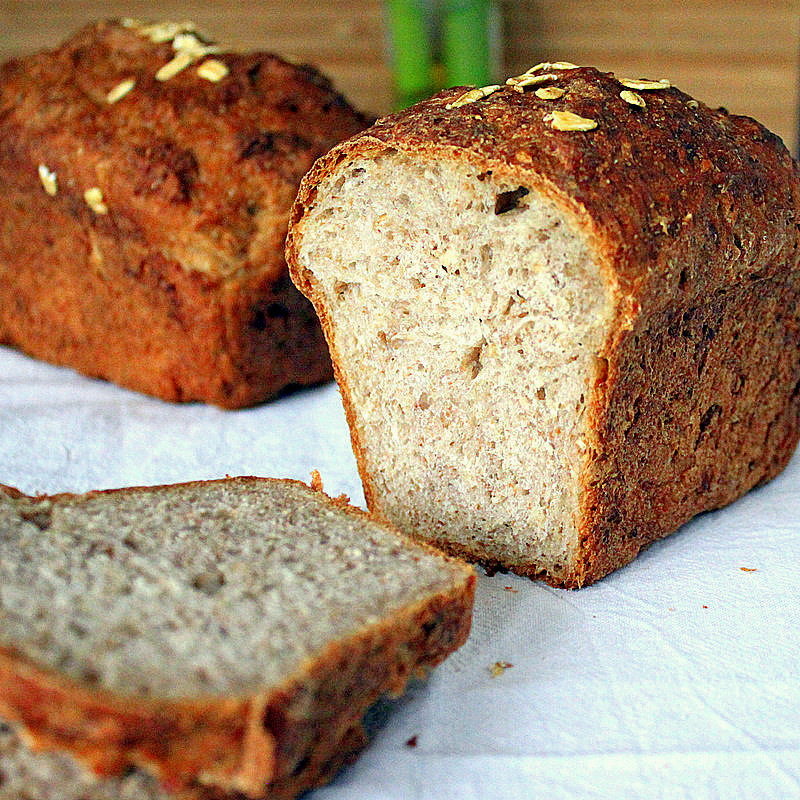 Richa has more breads for you in her blog. Check her Chocolate Multigrain Mini Loaf and Mango Strawberry Molasses Multigrain Mini Loaf! Thank you for this beautiful recipe! 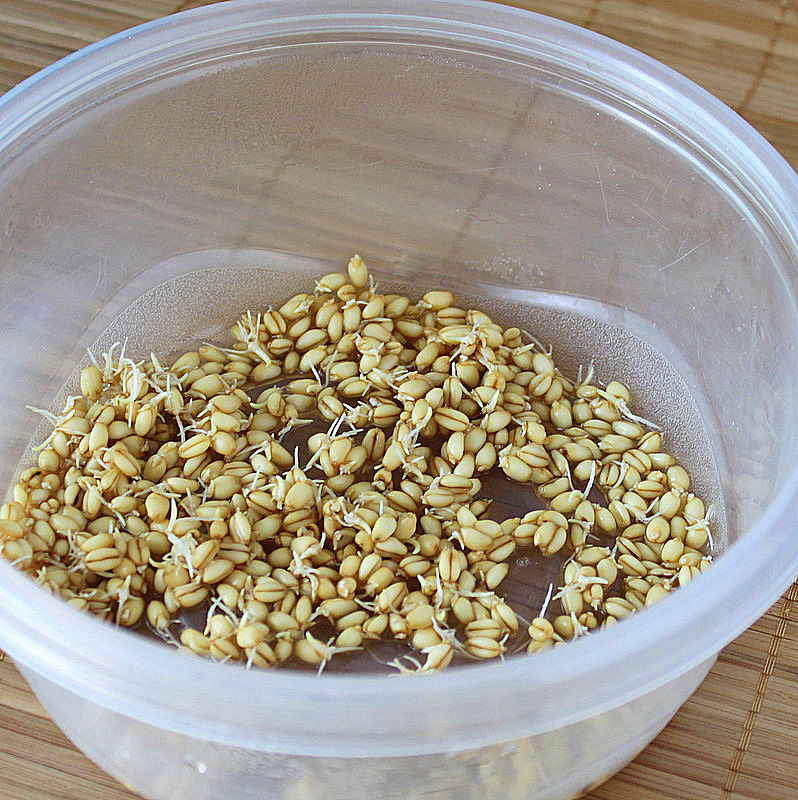 I have just one question: I don’t have much experience with sprouting and could use some pointers on how to sprout the wheat berries. Hi Michaela, to sprout most grains, soak them overnight in room temperature water, covered lightly with a lid or towel. Drain and rinse well and let sit damp, covered with a breathable towel or a light lid. Rinse every 8-12 hours. Depending on the ambient temperature, it will sprout in a day or 2. Hope this helps. Awesome bread…innovative combo of ingredients…kudos Richa. You and Richa have both been my inspiration to cook vegan food and its great to see her guest post for you. That sure is inspiring, Raji! Thank you. Yes, I am happy to have Richa here. Awesome! 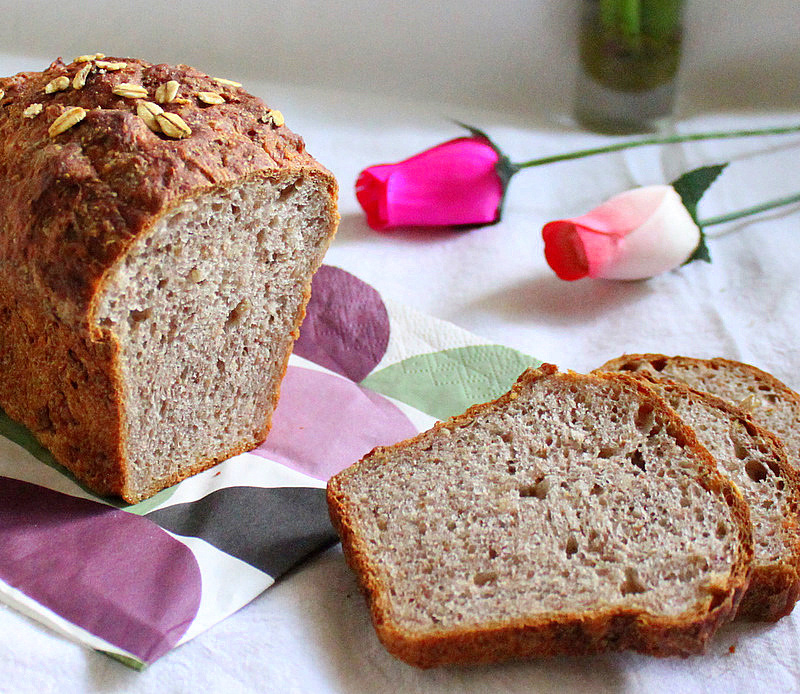 Bread with sprouted wheat sounds too good. Loved the texture. Thanks Richa and Harini for sharing this wonderful recipe.